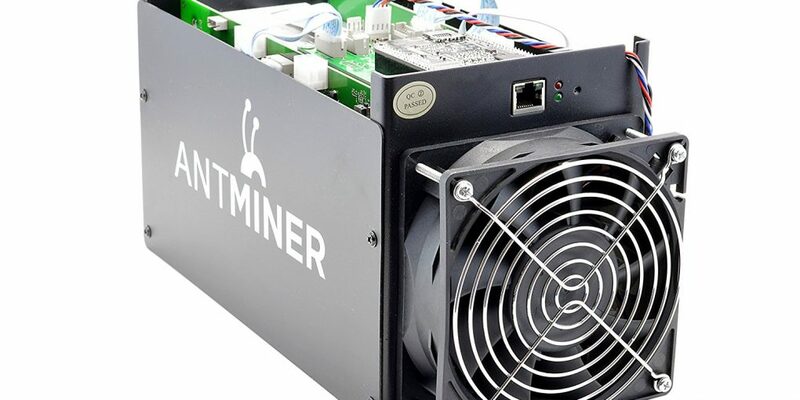 To purchase the ASIC Bitcoin Miner AntMiner S5, you need at least $190. The product is among the best Bitcoin miners in the market to consider, particularly due to the reduced power consumption, lower cost and ease of use. It has a hash rate of 1155 GH/sec and is suitable for people who want to run Bitcoin mining on large scale and or small scale. It has 60 chips of 28nm each that adds to the processing power and energy consumption stands at 590 Watts. What’s more, the manufacturer supplies it with one year warranty. The S5 has an open top which limits its placement and reduces safety. The manufacturer also constructs the sides and the bottom using fairly lightweight plastic. However, the plastic casing has its benefits – the unit only weighs 2.5kg or 6.5 lbs. We can only compare the noise level of the AntMiner S5 120nm fan to industrial vacuums. Therefore, without any doubts the product might not be a good choice for individuals who want to start Bitcoin mining in their home environment. It will engulf conversation and even irritate your pets and other people. But if you still want to run it in your home, you can opt for the ~ 75 decibel fan which is quieter. Mostly, people add a secondary fan to the S5’s back-end where the manufacturer has added screw holes for that purpose. The onboard temperature should remain below 80 degrees Celsius but if you want the product to exist for a longer period, you can maintain the temperature below 60 degrees Celsius. When the operating temperature is low, the S5 can be overclocked higher. That applies to all Bitcoin miners. At around 115 Volts, the ASIC Bitcoin Miner AntMiner S5 uses between 560 to around 590 watts. Therefore, with a sufficiently powered ATX Power Supply Unit, the S5 will function without any problems. In other words, you do not need to buy an old PSU if you have an old personal computer lying in your home. You can also buy a second hand PSU to start Bitcoin mining. % of power, silver means that you will lose 20% of power and bronze means that you will lose 30% of energy. PSU efficiency should be among your first topics of investigation if you want to be a serious Bitcoin miner. Inefficient and unrated power supplies are likely to increase your energy bill and produce unnecessary heat and noise. Bronze Certified PSU. With $100, you can get a second hand 650W model. Corsair is widely known for producing reliable computer hardware. Most of their customers include tech enthusiasts and Bitcoin miners. Their Bronze series provide better value. Note that under-clocking the ASIC Bitcoin Miner AntMiner S5can be challenging if a 9 Volt capable PSU is absent. The S5 does not need an external controller to function. For the setup, prepare the 24 pin connector’ paperclip and plug in the 4 PCl-e cables to the Bitcoin miner. Now, plug in the Ethernet cable from the miner to the router. Power on the PSU using the switch situated at the back. Ensure that the router’s DHCO table is on. If you already own a typical router, you will easily tell whether it is on. Using your computer browser, navigate to the router and check the IP assigned to the miner. Navigate to the IP. Use the “root” as the username and password to login. Navigate to the Status page and then to the Miner Configuration. Enter the mining pool’s information in the required format. Change the “Beeper Ringing” to “False”. Click on “Save and Apply”. Navigate to the “Miner Status” page and check whether the mining has already started. 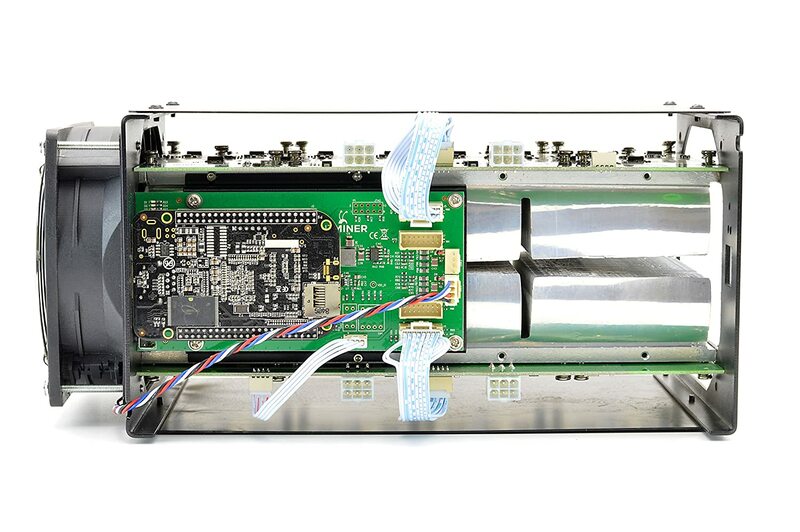 The AntMiner S5 ASIC Bitcoin Miner uses a single higher pressure 120mm fan. If the temperatures exceed 30 degrees Celsius, the fan’s speed increase to 4000 rotation per minute, which is relatively loud and highly contributes to the noise that the machine produces. Due to the noise, the machine is not suitable for home mining. However, you can do a few modifications to reduce the noise level. The software controls the RPM automatically and reacts to temperature increases. The machine has curved aluminium heat sinks which cool the front mining boards while its backs remain exposed. To prevent damages to the chips, the manufacturer attaches the heat sinks using compressive springs. You should be careful when handling the heat sinks because they are extremely sharp. The AntMiner S5 will produce 1 Gigahash after consuming 0.51 Watts. We can express the figure as 0.51 J/GH. And as you might notice on your electricity bill, the product’s power consumption may highly differ depending on the ambient temperature and the PSU’s efficiency. The product’s 0.51 J/GH is more efficient than the AntMiner S3’s 0.78 J/GH but lesser efficient than the expensive AntMiner S7 (0.25 J/GH) or the S9(0.098J/GH) models. Traditionally, Bitmain double the efficiency of every new model. Fundamentally, by increasing the efficiency or the overclocking, you can upgrade the product’s hashrate. However, that will increase the power consumption and the cooling requirements. The available methods of managing the overclocking burdens range from simple to extreme. And with serious efforts, you can easily achieve gains of ~400 GH/sec. You can also rely on oil immersion cooling. The price of S5 ranges from $190 to $299. With $413, you will get a new S5 direct from Bitmain. Because stocks are not always available, you might need to wait for some time. You should also be ready to pay for the shipping costs and the custom duties. Bitmain’s AntMiner S5 uses 28nm BM1384 chip along with new string power design. The manufacturer has spread 60 chips across the two hashing boards in the layout identical to that of the AntMiner S3. Unlike the S1, the S3 has no external case. It boasts lightweight airflow directors on the sides. It is standalone and you can run it without external controller.